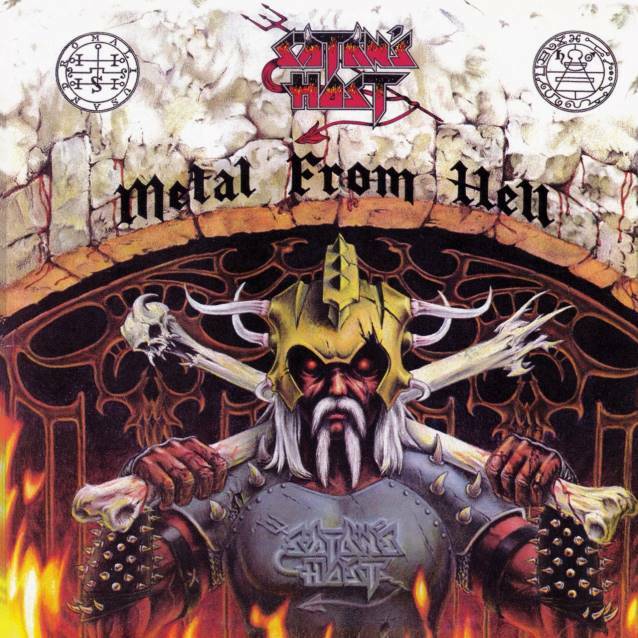 "Metal From Hell", the legendary debut album of the U.S. heavy metal cult act SATAN'S HOST, which except guitar virtuoso Patrick Evil, features JAG PANZER and TITAN FORCE singer Harry Conklin (a.k.a. Leviathan Thisiren), will be reissued by Skol Records. This "ultimate reissue" will not only include "Metal From Hell" tracks remastered from the original tapes for the first time ever, but also six tracks from the mystical "unreleased album" from 1987, titled "Midnight Wind". Skol Records' CD, which will be limited to only 666 copies, will include deluxe booklet with many previously unseen photos, original artworks of both "Metal From Hell" and "Midnight Wind", and all lyrics. The album will be released on April 25 and will have its official premiere at the Keep It True festival in Germany (which is co-headlined by JAG PANZER). In other news, SATAN'S HOST recently recorded cover version of the GRIM REAPER classic "See You In Hell", which will be featured on another Skol Records' release, "Harder Than Steel - The Official Keep It True Tribute Album" CD compilation, that will also include cover versions of heavy metal classics performed by acts such as ATTACKER, CRYSTAL VIPER, OSTROGOTH, DEADLY BLESSING, JACK STARR'S BURNING STARR and WITCH CROSS. The song was produced by Bart Gabriel (SACRED STEEL, JACK STARR'S BURNING STARR, MORTICIAN), who also remastered mentioned "Metal From Hell" CD reissue. SATAN'S HOST's eleventh studio album, "Virgin Sails", was released on November 18, 2013 via Moribund Cult Records on CD. The vinyl version was made available via High Roller Records in January. The album was once again recorded at Flatline Audio with producer Dave Otero (CATTLE DECAPITATION, ALLEGAEON, CEPHALIC CARNAGE) and features cover artwork by Joe Petagno (MOTÖRHEAD, MARDUK).